Denver International Airport (DEN) has embarked on a renovation of the Great Hall, which is the area under the tents of the airport’s Jeppesen Terminal. The Terminal encompasses 1.5 million square feet. Overall, the Great Hall Project will enhance security, provide a more flexible and open airline check-in space and add new dining and shopping options. It will also increase capacity of the Terminal, update the aging facility and improve the overall passenger experience at DEN. Construction is underway to renovate DEN’s Great Hall, and you will notice changes the next time you travel through DEN. 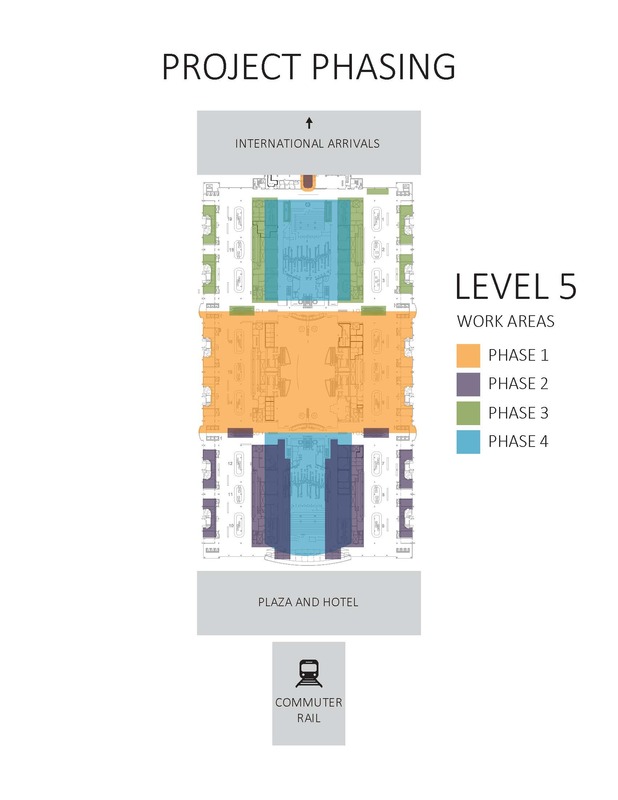 Phase I primarily includes work in the middle of the Terminal, including airline ticket lobbies, baggage claim areas and the current food court area, which is now closed. As a result, construction walls are in place blocking public access to the middle of the Terminal. New yellow construction signage has been installed to help navigate during construction. Check FlyDenver.com before you head to DEN. Delays are expected to be minimal for travelers during the first phase of construction, but we encourage you to check for information such as current security wait times before you arrive at the airport. Follow the signs. The Terminal will look different from what you may be used to. Make sure to pay attention as you travel through the Terminal and use posted signage to help you navigate around construction. When in doubt, ask for help. Find a friendly DEN Ambassador or customer service agent wearing a blue vest, or any airport employee you see wearing a badge. Access is still available to the north and south security checkpoints, as well as the A-Bridge checkpoint. If you are coming from the south end of the Terminal, you can reach north security and the A-Bridge checkpoint by walking through the baggage claim corridors on Level 5. Please note, once you reach the north end of the Terminal, you will have to go to Level 6 to access the A-Bridge checkpoint. Follow the yellow construction signage to the checkpoint of your choice. Don’t forget, monitors throughout the Terminal list current security wait times. The actual check-in process has not changed, but we recommend that departing travelers go directly to the designated airline drop off area at curbside for the easiest access. When you arrive, follow the signs posted on Peña Boulevard to your airline’s designated passenger drop-off area on either the east or west side. Below is a list of airlines and which door(s) you should enter to access your airline ticket counter. Due to construction, the restaurants in the middle of the Terminal have closed leaving limited dining options available. 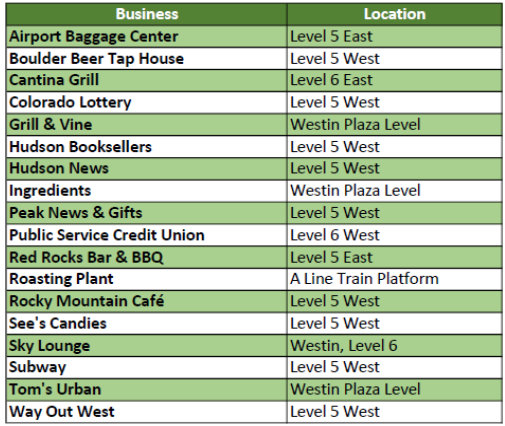 However, Subway, Red Rocks and Boulder Tap House on Level 5 and Cantina on Level 6 remain open. Grill & Vine, Ingredients and the Roasting Plant at the Westin hotel and transit center across the Plaza from the Terminal also provide great dining options. Temporary grab-and-go food and beverage options as well as Starbucks have been added in the Terminal. Additionally, there are many shopping and dining options on the concourses for arriving and departing passengers. Restrooms are located on Level 5 on both the north and south ends of the Terminal and on Level 6 on the north end of the Terminal as well as near Public Service Credit Union and Cantina. The easiest way to get from one end of the Jeppesen Terminal to the other is to walk through the baggage claim areas on both sides of Level 5. 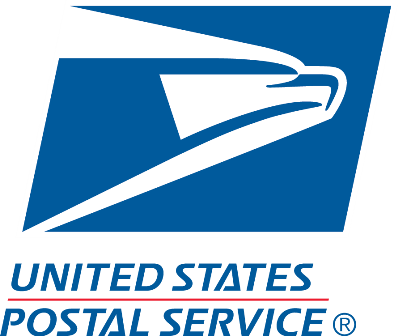 If you need assistance, please ask a customer service agent or Ambassador. Ground transportation options such as taxis and rental car shuttles still pick up on Level 5 on the east and west side. Ride app pickup (Lyft/Uber) is on the east and west side of Level 6. These passengers should go to the door specified by the driver. Inside the Terminal, the information counters for Epic Mountain Express, SuperShuttle and Green Ride Colorado Shuttle have all relocated to Level 5 on the northeast side near north security. All rental car counters have been removed. If you have a car reservation, go directly to east or west side of Level 5 and follow signage to your rental car shuttle. For reservations, please call the rental company of your choice to check availability. Access to the RTD commuter rail to downtown Denver is still available from Level 5 of the Terminal. Walk along the baggage claim corridor on Level 5 toward the Westin, exit the Terminal onto the plaza and take the escalator down to Level 1 of the Transit Center. Elevators are also available inside the Westin for passengers with large luggage, strollers or pets. 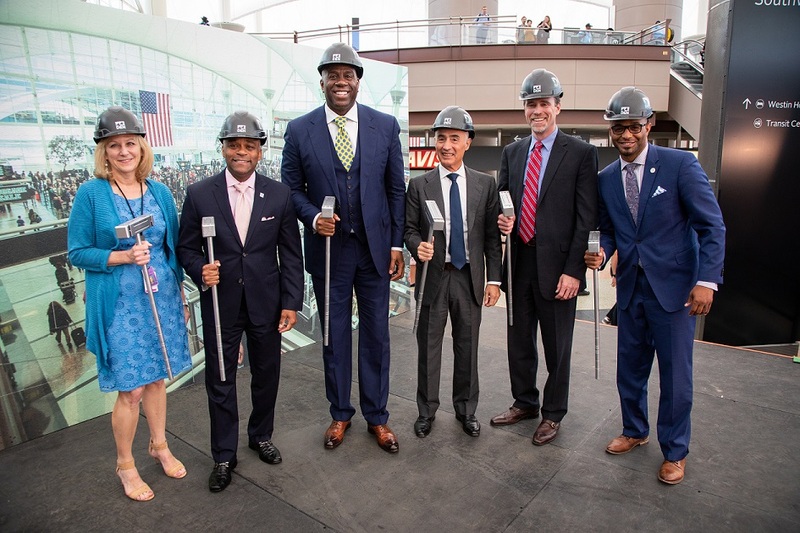 On Thursday, July 12, Denver International Airport (DEN) formally kicked off the start of construction of a three and a half-year renovation project of the Great Hall. The Great Hall is the area under the tents of the airport’s Jeppesen Terminal, which encompasses 1.5 million square-feet. 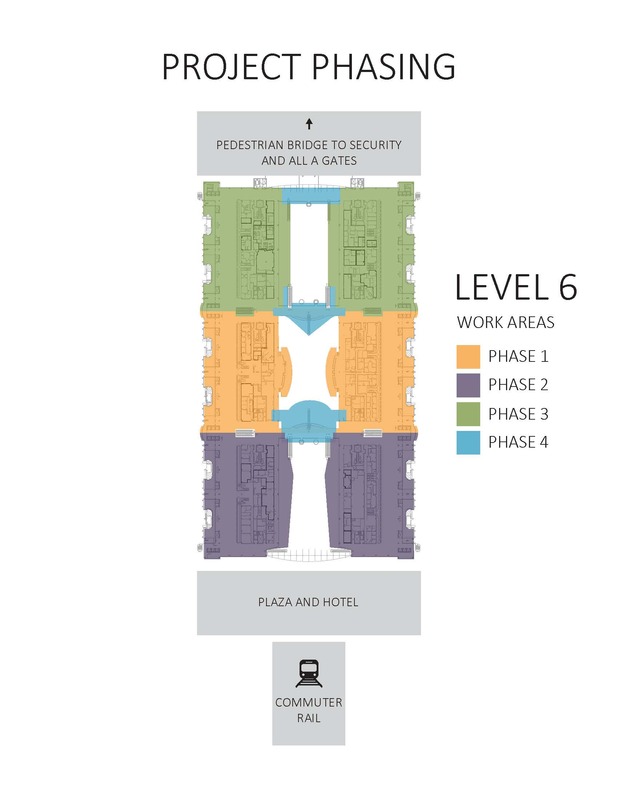 The project will make substantial improvements to Levels 5 and 6. The Great Hall Project will enhance security, provide a more flexible and open airline check-in space and add new dining and shopping options. It will also increase capacity of the terminal, update the aging facility and improve the overall passenger experience at DEN. Phase 1 construction walls are now up in the middle section of Jeppesen Terminal as crews work on Phase 1 of the Great Hall Project. The first walls are up on Level 5 near the baggage claim doors (closest to the curbs), but will not impact access to the terminal. Installation of all construction walls were in place by the end of July. Phase 1 is under construction and will not impact security screening or check-in processes. However, construction walls may require additional time to navigate from the check-in counters to security. Check FlyDenver.com before you head to DEN. Delays are expected to be minimal for travelers during the first phase of construction, but we encourage you to check for information such as current security wait times before you leave. Follow the signs. The terminal will look different from what you may be used to. Make sure to keep your head up and use posted signage to help you navigate construction as smoothly as possible. When in doubt, ask for help. Find a friendly DEN Ambassador or customer service agent wearing a blue vest, or any airport employee you see wearing a badge, if you have any questions or need assistance. Construction of the Great Hall will take place in four phases with some preparation work already underway. For instance, some restaurants have already closed, ground transportation counters have relocated and some of the artwork in the terminal has been temporarily placed in storage until construction is complete. The airport’s unique and conversational art will return upon completion of the project. Construction walls and new wayfinding signage are also going up in the terminal. Note: The map below depicts approximate work areas for the four different phases of the project. We invite you to browse this site to learn more about the Great Hall Project and its mission to create a more efficient and enjoyable experience for the travelling public. Be sure to subscribe below to receive Great Hall News — the official newsletter of the project — to stay in the know. In general, dining and shopping options in Jeppesen Terminal will be limited throughout the project, as all existing concessions will close eventually. The good news is the closures will happen in phases. And, we are actively working to secure temporary concessions in the terminal to help bring some food and beverage options to our passengers. And, don’t forget, there are several great dining options at the Westin Hotel and Transit Center. You can enjoy breakfast, lunch or dinner at the Grill & Vine, Tom's Urban or coffee and snacks at Ingredients all located on Level 5 of the Westin. You can also enjoy coffee and snacks at Roasting Plant on the train platform level (Level 2) of the Transit Center or Starbucks in the terminal near arrivals (Level 5). There are also plenty of dining and shopping options available by A, B and C gates. Below is a list of concessions that are saying their goodbyes, as well as those that will remain open during Phase 1. Several airlines have moved their ticket counters to temporary locations. Airline moves will continue through much of the project until work on the ticket counters is complete in early 2020. You can always find an updated list of airline ticket counters here. In April 2018, Great Hall Partners, the team selected as the developer for the Great Hall Project, launched the process to determine who will reside in the new concession spaces in the Great Hall. The process closed on June 12, and an announcement about the first new concessionaires selected is coming soon. Learn more about the future of DEN concessions at rfp.greathallpartners.com. IF YOU HAVEN'T YET, CHECK OUT THE LATEST EDITION OF GREAT HALL NEWS — THE OFFICAL NEWSLETTER OF THE GREAT HALL PROJECT.